Attempting to coin the nickname the ‘British Bolt’ is ambitious in the extreme – some may say folly, given the sheer depths of achievement and worldwide appeal of the Jamaican legend – but Reece Prescod’s team feel it’s about time the wider British public knew the young sprinter’s name. 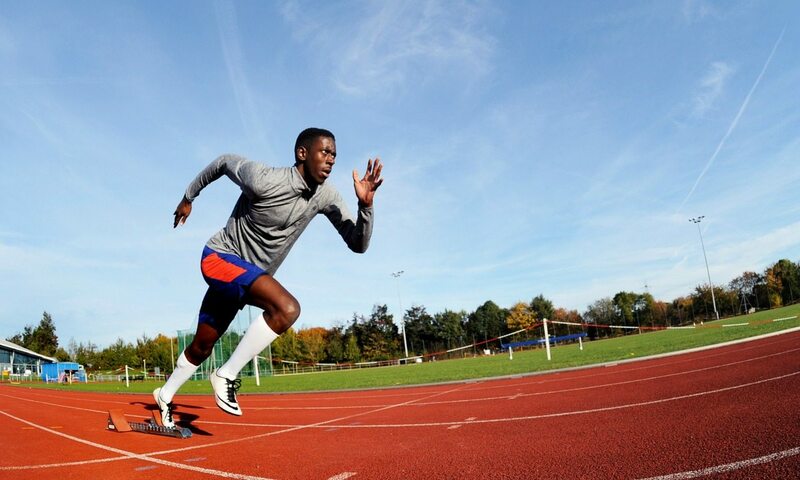 As Europe’s No.1 junior 200m runner in 2015, despite running just four races, and England’s under-20 champion from 2013, Prescod is already well-known internally in the British athletics community as a hot talent. But the 20-year-old’s 10.04 100m at the England Athletics Championships last year sent a ripple of shockwaves through to the country’s Olympic-bound sprinters, who were almost literally boarding the plane to Brazil when Twitter told them of Prescod’s achievement. Off the back of two years’ worth of injuries, and with just one year of full-time training and living an athlete’s life under his belt, the Walthamstow-based athlete finished joint-fourth in the country over 100m and fifth over 200m. All things considered, it’s been a positive one. Having witnessed it first-hand, what was also stark about Prescod’s breakthrough run in Bedford was the ease with which he did it. Shutting off with 20 metres to go, dropping his arms and shortening his stride length, there’s little doubt there was more in the tank. Until now Prescod has seen himself as primarily a 200m runner, while those on the outside have even urged him toward 400m given his 6ft 4in frame. Prescod is confident he has the skills to master the full range. “Now I’ve done the 10.04 in the 100, which is considered a world-class time, it makes me wonder what one I want to do,” said the Nike athlete, who picked up from where he left off by starting 2017 with a 6.67 60m PB at Lee Valley to improve on his previous best of 7.01 from 2013. “I’ve always liked the 100 but because of my height I’ve been shunned away from it. People say I’d be good at 200 and 400. His parameters, Prescod says, have now shifted in his mind. Going from a 10.7 personal best to within reach of sub-10, and cutting 0.3 off his 200m best in a 20.38 run on his Diamond League debut in Lausanne, mean his own demands have naturally increased. He insists that an upper limit won’t ever be established. “With my team I have so much to work on. I love coming to training and having people say ‘Reece you need to do this. Reece you need to do that’,” he said, enthused by the fact that within his training group, run by Jonas Tawiah-Dodoo and overseen by the coach’s Speedworks team, they push each other on a daily basis, testing themselves against one another numerous times per week.